"Doris, as big-band vocalist Jo Jordan, is really playing a version of herself, right down to the alliterative name. This is not just a case of a movie star’s persona shining through every role she plays. This is a case of Doris Day reliving events from her own life, a youth spent touring the country on hundreds of one-night band gigs. Jo’s first vocal, 'The Very Thought of You', is sung with such knowing intimacy that the fact that this woman knows her way around the music world is instantly established. Watch Doris Day’s body language in the film when she is either singing in front of the band or recording in the studio— she is thoroughly relaxed and at ease. She is home. Music is in this woman’s soul." - Santopietro, Tom (2008-08-05). Considering Doris Day (Kindle Locations 619-622). St. Martin's Press. Kindle Edition. The first of 3 films in 1950, this one paralleled Doris’ life as a band singer in many ways. Great standards by Doris with Harry James and his Orchestra, which led to a #1 selling album of the year, the first time an album by Doris topped the charts, but not the last time. “With a Song in My Heart” and “The Very Thought of You” became popular favorites that year via single recordings. After three films in which Doris was in the lead position, she takes the role of a supporting character in this film. It is said that she was so good that Warners could not get the vehicles for her out fast enough. The plot of this film revolves around the life of tragic jazz great Bix Beiderbecke. Kirk Douglas plays the Beiderbecke character, here named Rick Martin. An ace trumpeter, Martin is one of the few white musicians to flourish in the black-dominated jazz scene of the 1920s. Chafing against the dullness of the "respectable" orchestras for whom he works, Martin finds at least two kindred spirits in the forms of torch singer Jo Jordan (Doris Day) and piano player Smoke Willoughby (Hoagy Carmichael). He rises to popularity with his own group, and along the way falls under the spell of wealthy jazz patroness Lauren Bacall. After marrying Bacall, Martin begins neglecting his music and turns more and more to alcohol. When he skips one of her fancy parties to attend the funeral of his mentor Juano Hernandez, Bacall angrily smashes all his jazz records, effectively ending what was never a very solid relationship. Crawling into a bottle, Martin loses his touch with the trumpet -- a heartbreaking sequence, in which he goes to pieces in the middle of the pop standard "With a Song in My Heart". Unlike the real Beiderbecke, who died of alcoholism at the age of 28, Rick Martin is rescued by his faithful friends Day and Carmichael. 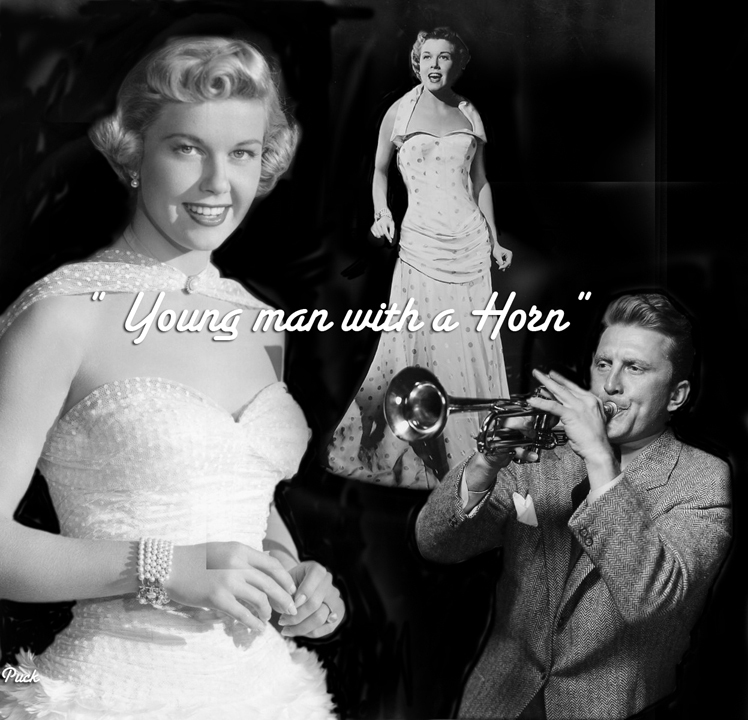 Kirk Douglas's trumpeting in Young Man with a Horn was effectively dubbed by Harry James, while jazz pianists Buddy Cole and Jimmy Zito make uncredited soundtrack contributions. The film was adapted by Carl Foreman and Edmund H. North from a novel by Dorothy Baker. Rick Martin: [to Amy] That trumpet's part of me. It's the best part. You almost made me forget that. Rick Martin: I'm not going to be tied down to anybody or anything. From now on, I'm playing it my way. Rick Martin: [to Amy] What a dope I was. I thought you were class, like a real high note you only hit once in a lifetime. Released in the UK as Young Man of Music. Here's a special video remake of the film by one of Doris's greatest fans, Christie. This is how most Doris fans would have wanted the movie to play out.